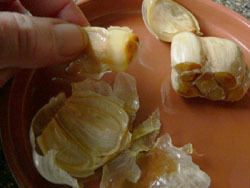 my roasted garlic recipe method is the simplest. Keep it simple and easy to clean up. 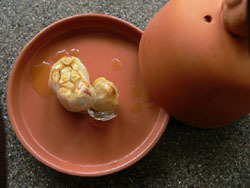 If you do use the clay pot, remember to soak the top and bottom for at least 15 minutes. This will provide moisture for the garlic while roasting. Place the garlic bulb in a piece of tin foil. Drizzle a couple teaspoons of olive oil over head of garlic, using your fingers to make sure the garlic head is well coated. Fold the foil, crimping the ends to seal it. Bake at 400°F for 30-35 minutes, or until the cloves feel soft when pressed. Eat as is (I love straight roasted garlic) or mash with a fork and use for cooking. Can be spread over warm French bread, mixed with sour cream for a topping for baked potatoes, or mixed in with Parmesan and pasta. 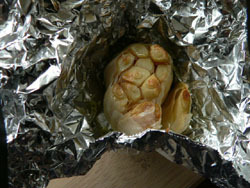 Time Saver: I roasted a number of garlic bulbs since the oven is hot, and freeze what I am not using right away.